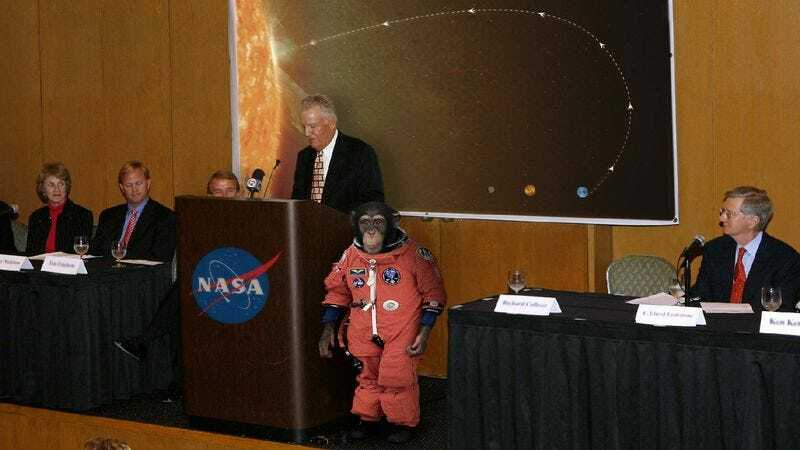 WASHINGTON—In what is being called a crucial step forward in solar exploration, NASA officials announced Wednesday a new mission to launch a chimpanzee directly into the sun. “Chimpanzees are our closest biological relative, so we can learn a great deal by observing how they react to being deposited into the sun’s plasma core,” said NASA Administrator Charles Bolden, adding that the single-occupant capsule would contain sophisticated instruments that would monitor the effects of the sun’s 27 million-degree interior on the physiological functions of the animal. “Hopefully, what we learn from this mission will pave the way for sending human astronauts into the sun on a regular basis.” Bolden went on to suggest that, should humans be successfully launched into the sun, there may one day be a permanent colony there.